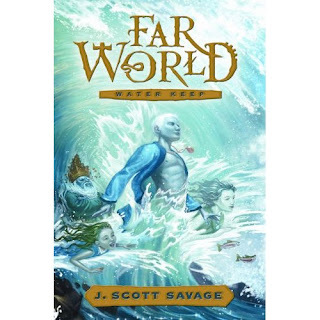 J Scott Savage sent his book Farworld to me quite a while ago. I started to read it and unfortunately got distracted. I didn't have the time to get really into it and was starting to feel like I had to 'hurry up and read this', which is bad, bad and not good for anyone. So I put it aside with the thought of coming back to it...but I didn't. Next thing I know this book is about to be released and I get a very thoughtful email from the author- thanking me. I think, "Epp! Bad Blogger! I have to write something about Farworld." Farworld is about two special kids from two different worlds- literally. One has grown up an orphaned boy with a disablity here on Earth, the other is a girl without magic in a magical land: Farworld. Both are being pursued by some Very Bad People who want them dead. Marcus and Kyja join forces and together they must defeat the evil of the Dark Circle. Farworld has two engaging and unlikely heroes: Marcus and Kyja. You can't help but love these two. The pace is very quick. The adventure starts right from the beginning. It's very intense but there are a couple of funny characters to lighten the mood. The writing is just right for the younger audience. I read about half of this book, just to let you all know. I don't think it's the book for me but I think this is the perfect novel for lovers of YA and fantasy. I'll be saving this for my daughter when she's older. Farworld has an awesome looking website (it takes a bit to load). Dude, it looks like a movie trailer. I've had a few ARCs sent to me now and by the time I got around to reviewing them, they weren't so advanced any more. I feel so guilty I rarely sign up for them anymore, even though I could really use some free books! Did you survive the weather? You guys got it worst than we did, it was not that bad here at all! K- Just a bit of rain and hardly any wind here. We had worse rain last weekend. It was easy peasy. Maybe on the other side of the island? Every book is not for every reader. I loved Farworld. Are you getting hit with the remnants of Hanna this week? Yesterday or today? My sister, Framed, just returned from a cruise that stopped in Sydney and Halifax. I haven't talked to her yet because she got home late last night and had to work today. I'm so excited to hear how everything went. I'm trying to figure out how I can make it back to that part of Canada. Loved it last summer. John- If I don't get to them right away, I end up way behind. Booklogged- It wasn't too bad. Just a bit of rain and wind. I hope your sister had a good time and good weather. It had been a terrible August. We usually have hot dry weather then but it rained so much we broke records- and not in a good way. I was downtown last weekend when a ship was in. There were lots of tourists walking around. Maybe your sister was one of them. I hope so because that was a nice day. I just got a copy of this one (won in a drawing) and I'm so excited! But, I probably won't get to it right away. I know that feeling that you have to read something immediately and how that can totally ruin the enjoyment. I'm thinking my kiddo will love this one, so he may get to read it, first. Weekly Geeks 15: What Is It?